Size: 14.1 x 9.8 inches. Colouring: In attractive original colours. Condition: Paper slightly age-toned. With vertical fold, hardly notable. Generally in very good condition. 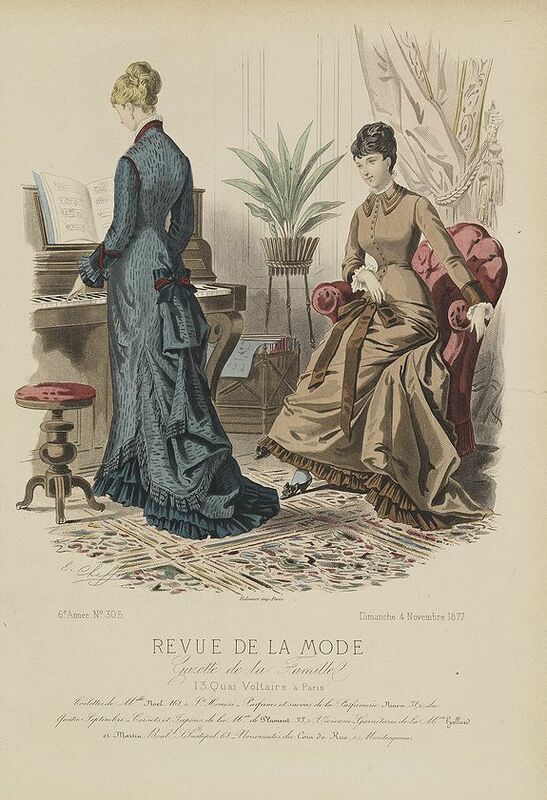 From "Revue de la Mode - Gazette de la Famille". Underneath the print are the names of the shops where the clothing's, perfumes, porcelains, flowers, etc., depicted in the engraving, are to be obtained. The later quarter of the 19th century there was a proliferation of women's magazines. These periodicals, whose circulation in great numbers, created heightened interest in clothing, needlework and household decor. The average homemaker was exposed to the latest in Parisian fashions. If she had some skill as a dressmaker or the money to employ one she could replicate the dresses depicted in these magazines. The hand-coloured French fashion engraving was responsible for filtering the new styles throughout the major cities of Europe, America and Japan and thus represented great wealth to the clothing industry of Paris. No expense was spared to commission talented engravers and colourists for these beautiful works of art.